Discussion in 'Lighting and Electrics' started by Dustin Druckman, Apr 16, 2019 at 11:25 AM. I am trying to covert a few stage pin drop boxes to socapex ends so that i do not need to haul these giant boxes up and down when tours come in. I opened the box up though and there is only one ground wire running in the cable and it is going to a bar in the box that the ground for each circuit is coming back to. my question is how should i run this single ground into the socapex end? do i just solder jumpers to a single point and then attach the ground to that? You'd take the ground leads from the common bar and route them to the connector on pins 13-18 respective to their hot/neutrals. ...and so on for the remaining 3 circuits. Furthermore, you could use a grounding ring and two leads in the cable for grounding. However, I am not a fan of bonded grounds in Socapex. My old-person sensibilities say: "well, they gave us the chance to have independent grounds..."
my question is how should i run this single ground into the socapex end? do i just solder jumpers to a single point and then attach the ground to that? Pretty sure you'll find that the vast majority of "Socapex -style" cable is 14 conductor, not the expected 18 or 19. Wires 13 & 14 are both connected to pins 13-18 via ground ring as above. Side note: Installing Socapex connectors is not for the inexperienced, especially in the field. You might find it prudent to buy 12/14 cable with one bare end and one female 19-pin pre-installed. Then it's a matter of landing the bare wires inside the grid box, and strain relief. I’m not doing anything with the box. It is going away. I am just using the cable from it to connect to a female Socapex. I have done this plenty of times I have just never come across a wire with only 13 leads. I usually see at least 2 grounds and then use a ground ring and I was clarifying if I should do something different with only 1 ground. I have not seen one with only 13... But I have not been everywhere. Is the ground lead 10 gauge? We have a similar problem a little more north of you. we've got Drop boxes, that we usually have to drop for the roadshows (because we need the pick points) but ours are just run up to points on the grid to drop in an out. The other side of the stage though has soca runs instead of boxes and those we can just extend or add breakouts to as needed. The pick points/pulleys make it pretty easy to move our boxes around, most of the weight really comes from all the cable you're moving, the dropbox itself is fairly negligible for us really. I talked to Devon and really do just need to get down there and see how you guys do things compared to how we do. I have a lot of changes I'd like to make. What does the jacket say? Are you sure it's not 14 wire and one is just clipped off right at the jacket? A ground ring on soca works fine and is the most common, but there really should be 2 ground wires. Where do these boxes live that you have to haul them up and down. I would suggest getting some fanouts and some soca cable and dropping picks from their location. Taking that cable and making into a soca is going to be more of a pain than you think. And done wrong could result in damaged equipment or shock. TLDR: buy the proper cable. shall meet the minimum requirements of 392.10(B)(1)(c). There appears to be a red wire from the borderlight cable not doing anything, laying on the bottom of the box, so maybe it is 14 conductor. Further, what does code say about wire color? The left-most 2P&G outlet is wired with three greens! The right-most outlet uses white for both neutral and hot. There is a black tracer on one of those whites. Guessing this was Strand originally - and consulted on by my former employer. Here's what the code says about color. 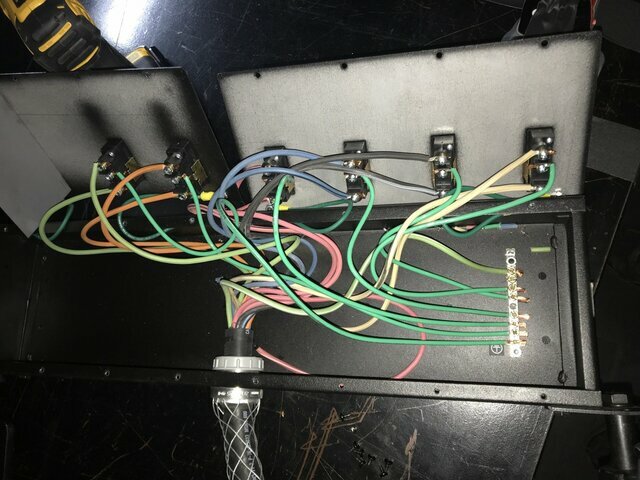 This is a relaxing of the Chapter 1 through 4 color requirements, since high conductor-count multiconductor cables don't have enough whites and greens to meet the general code requirements. be identified by a distinctive green marking at their terminations.